Occasionally we are asked to accommodate special diets for breakfast. We’ve prepared gluten free, vegan, vegetarian, and candida diet recipes. 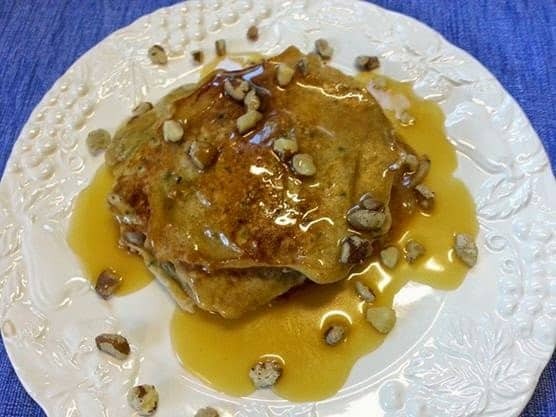 This zucchini bread pancakes recipe can easily be adapted for most special diets, and the best part is that it tastes great! In a large bowl, combine eggs, olive oil, sugar, buttermilk and vanilla until smooth. Stir in zucchini. In a smaller bowl, whisk together flour, salt, baking soda, cinnamon and nutmeg. Stir dry ingredients into zucchini batter, mixing until just combined (batter will be thick). Preheat oven to 200 degrees F and place a foil-lined tray on middle rack. Heat a large, heavy skillet (or electric skillet) over medium heat. Once hot, melt a pat of butter in pan. Scoop 1/4 cup dollops of batter in pan so the cakes do not touch. Cook until bubbles appear on the surface, about 2-3 minutes. Flip pancakes and cook another minute or two, until golden underneath. Transfer pancakes to prepared pan in oven to keep warm as well as to ensure that they’re cooked through when served. Repeat with remaining batter. We serve these with buttermilk syrup, but you could also top with walnuts and almond butter, or maple syrup with a dollop of Greek yogurt. Again, just adapt the topping to your diet! In a LARGE saucepan (I use a 4-qt. ), stir together the sugar, buttermilk, butter, corn syrup, and baking soda. Bring to a boil and cook for 7 minutes. Watch constantly and stir often, as this will foam up quickly! Remove from the heat, and stir in the vanilla. We try to make breakfast at Tiffany’s a memorable meal for all our guests, including those on a restricted diet. During your stay, we’ll prepare a different breakfast each morning. And if you have specific dietary requirements, just please let us know when you make your reservation so we can do our best to accommodate your request.